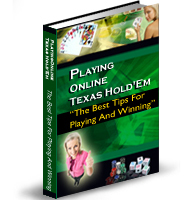 If you play texas holdem poker tournaments you have no doubt hit the point where you are getting close to the final table, you get a couple big losses, maybe even a bad beat or two (losing to a one or two outer really hurts), and suddenly your poker chip stack is very short with only a few big blinds left. When do you make your move, and with what? The blinds are high, and if you wait for a great set of hole cards you could be blinded out before you know it. Of course you might get lucky and get wired Aces or some really great hand, but probably not. You only have a very few hands left and you are taking the walk of shame out the door. What kind of hand should you all-in on? A weak Ace or two face cards? Well you could. But the main thing when you make your last stand is to have two live cards. You do not want to be dominated (sharing a card with your opponent), as that kills one of your two hole cards. Well, think about this: what are your opponents most likely to call your all-in bet with? Probably a set of hole cards with an Ace or two big face cards. Thats exactly the kind of hand you feel like you should go all-in with, but wait, those are the type of cards that will call you and youll possible be dominated with only one live card. Why not give yourself a decent shot at doubling up. If you play the all-in with two cards that you are less likely to be called with, youll have two live cards, possibly doubling your chance of doubling up your poker chip set stack. You only have a few hands left to make your stand. When you get two cards, its nice if they are suited or connected, but the main thing is that they are both live cards. A 7 and a 9, a suited 6 and 4, these are the type of hands least likely to be dominated. Lets face it, at this point you are desperate, and youre going to need some good luck in any play to stay in the game. When making you all-in last stand, pick the hole cards youll least likely to be called with. Most poker players wont call your all-in with a 6 9 off suit, theyll call with the weak Ace or two face cards. Yes youre still a slight underdog, but youll have two live cards, not just one, to try to get lucky with. Poker has a lot of luck to it, but if you use a solid strategy you can better put yourself in a position to get lucky. That what wins poker tournaments and cash games as well. Put yourself in a position to increase your odds of getting that little bit of luck you so desperately need. Owner of PokerUpShop, an online Poker Store offering a huge selection of Poker Card Protectors at very affordable prices, and a full selection of poker chip set and Poker Cards. PokerUpShop also offers free US shipping on all orders over $49 which will save you money on your poker supplies.